Our former client, Connie, is back with a request to add a few touches to her master bathroom. We previously completed a Full Service Design on her Miracle Mile Master Bedroom, where we were able to start with a completely blank slate. Her bedroom has a polished but laid-back California vibe and she'd like to extend that look through to the bathroom which connects with her (more traditional style) office/reading room. 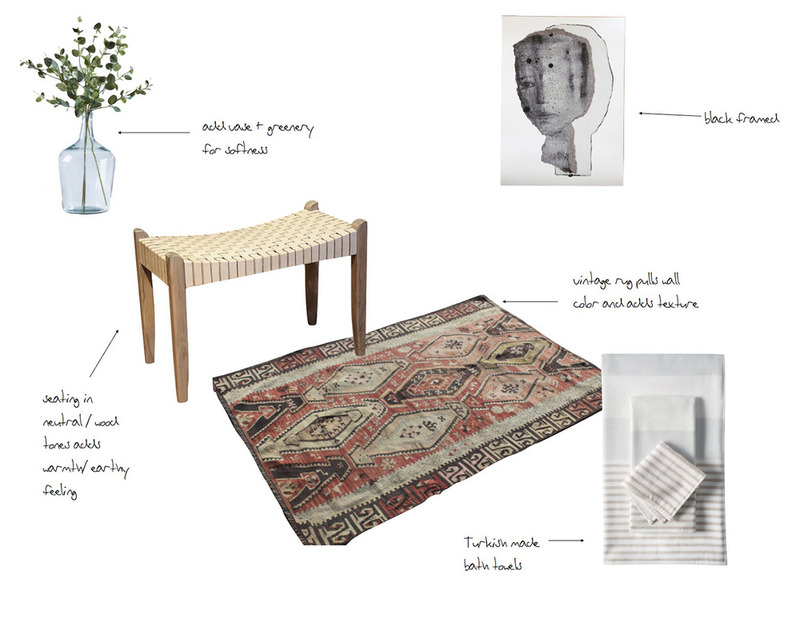 The mood board above shows the design inspiration we'll use to marry the styles of the two rooms and take Connie's bathroom from so-so to spa like. We'll be bringing in a mix of vintage, modern and organic elements to achieve a Modern Boho style that perfectly compliments her Los Angeles bungalow. A One Day Restyle is all this room needs to pull it together. We'll bring in a vintage Turkish rug with earthy tones to pump up the personality while adding warmth and texture and juxtaposing the cold tile floors. Mixing vintage rugs within a modern space is one of our very favorite home decor trends and one that we don't see going away anytime soon (check out our previous post, Online Sources for Vintage Rugs for some of our favorite sources). A teak stool will provide seating for the built in vanity area and serve as a way to bring in more natural, earthy tones. For a modern touch we'll add a fine art print by contemporary artist, BorianaM. Finally, we'll finish the space off by switching out her existing towels with a new set of Turkish bath towels (love) and adding fresh flowers or greenery to a beautiful vase. We'll be sharing the Before + After of this One Day Restyle here on the blog so be sure to check back!